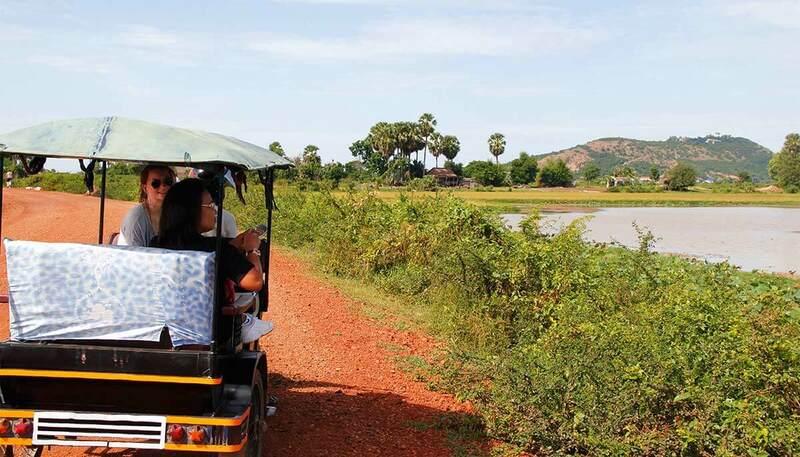 The Cambodian motorcycle rickshaw – the Tuk Tuk – is for me the best vehicle in Siem Reap and its surroundings. Up to four people can be seated opposite, with the two most comfortable seats facing the direction of travel. Siem Reap can be explored wonderfully together with the surrounding countryside on a comfortable cushion with airflow around your nose. Tip: Have a Tuk Tuk pick you up at the airport if you don’t have that much luggage. Even if it may cost extra, because your hotel only offers free transfers by car or minibus. Believe me, just after a long flight you will enjoy the ride with the Tuk Tuk. It is best to ask in advance at the hotel whether they will send you a Tuk Tuk to the airport. If you are courageous, you can also take the chance and take one of the available Tuk Tuk drivers at the airport. Be sure to have the address and phone number of your hotel ready. What does a Tuk Tuk ticket cost? The prices should serve you as a guideline. If a price seems too high to you, you can trade. And if you don’t agree with the Tuk Tuk driver – for whatever reason – just go to the next Tuk Tuk driver. Trips to special events like Phare, the Cambodian Circus: $8-10 including waiting time. Your Tuk Tuk driver will pick you up at the end of the event and take you back to your hotel or or city center. Other temples: Phnom Krom $7 , Rulous Group $20, Banteay Srei $25, Beng Melea $30, Phnom Bok and Phnom Kulen $35. Tip: Find your Tuk Tuk driver on your own and negotiate the price directly with him. Firstly, this has the advantage that you spend the day with a Tuk Tuk driver who is likeable to you. Secondly, you save the surcharge that the hotel charges for the booking. Honestly: A Tuk Tuk ride of $2 or $3 with a $50 bill to pay for is rubbish. Tuk Tuk drivers usually do not have much money. And if you don’t have much money, ou can’t change bigger banknotes. The best thing to do is get yourself a bundle of $1 notes before you go to Cambodia. With these you are well equipped to pay not only your Tuk Tuk driver comfortably. Even at markets, in streetfood restaurants etc. small notes are an advantage over a $100 note. Note: There are Tuk Tuk drivers who take the same price. No matter if you enter the Tuk Tuk alone or with a total of 4 persons. Others want a higher price if they have more than one passenger to carry. Or one of the passengers is not as slim. At first glance this may seem quite greedy, but according to Cambodian logic the calculation is simple: more passengers = more weight = more fuel costs and higher wear. Sounds reasonable, doesn’t it? Everyone has to eat, including your Tuk Tuk driver. So don’t be surprised if he takes you e.g. during your Angkor tour to a restaurant overcrowded with tourists. Usually these restaurants are not only overcrowded, but also overpriced. The fact that your Tuk Tuk driver will take you exactly there when you ask him where you can eat well has one simple reason: He gets something to eat there for free. A practical and sensible arrangement for restaurant and Tuk Tuk driver, but not for you. Tip: Offer to invite your Tuk Tuk driver to lunch at your expense. Tell him to show you another, more beautiful place. Stay a little stubborn, because at first he may not believe you and worry that he won’t get lunch. And: respect if your Tuk Tuk driver doesn’t want to eat with you at the same table. 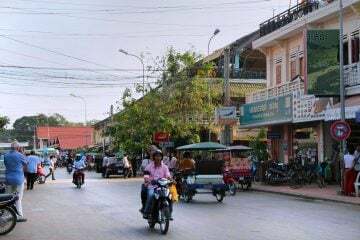 Unfortunately, it sometimes also occurs in Siem Reap that handbags and luggage are simply dragged along by motorcycles. So take care of your luggage. Make sure that your camera, smartphone and everything else you care about is safely stowed away. Best on the floor and between your legs. In many Tuk Tuks there is a lockable flap. Ask your Tuk Tuk driver if he keeps your things there. This is especially handy if you have a little more luggage with you – for example on an Angkor tour, when you get in and out of the Tuk Tuk all the time. Let’s go to Angkor Wat, but what do I wear? Sunset in Angkor Park – 34 hotspots! Next ArticleAngkor Wat & Angkor Park: Info, prices, tips & more!